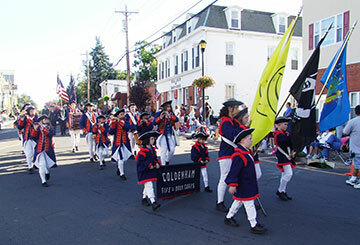 The Coldenham Fife and Drum Corps. was organized in 1966 under the sponsorship of the Coldenham Fire Company with Joe McVeigh as it's first Director. Our original membership of the Corps was children, thus it is being know as the Junior Corps. Most of the original members were children of the Coldenham Firemen. The original uniform was basic, but fitting for the Colonial time period. Red vest, trimmed in gold with long sleeved white shirt, black pants and a tricorn hat. Many of the fife instructors during the years were from the continental Fife & Drums of Cornwall, NY. In 1976 the corps changed uniforms to a patriotic theme for the Bicentennial. The new uniform was a blue woodsman type garment trimmed in red, with white pants, and the tricorn hat. In the early eighties, as the corps members grew older, Joe McVeigh left the corps to form the Civil War troopers. After a reorganization, Joe Keenan took over the reigns as Director and Fire instructor, while Dave Keenan took over as Drum Instructor. Over the next few years, the corps did many paid parades and got a grant through IBM to purchase new uniforms again, this time with a more traditional revolutionary period theme. These new and still current uniforms consist of a blue colonial coat, double breasted with red and gold trim and lots of gold buttons, traditional knickers, reversible blue/white vest, and new Tricorn hats. In the nineties, Dave Keenan took over as Director and continues to work with the kids to bring the corps where it is today. We are pleased to have celebrated our 40th anniversary in 2006. We have traveled many miles going to parades as far away as Lake Placid. The corps has also journeyed to Connecticut to participate in the Deep River Ancient Muster. It is a big accomplishment and great honor to march with 70 other Fife and Drum corps in the annual July event. We would like to honor and thank all of our past directors, members, the Coldenham Fire Company, and all those who have supported us over the years.